Kaua’i invites families to be as active or laid-back on their Hawaii beach vacation as they choose: plop in the sand, play in the surf, or follow rainbows in a rental car exploring the island’s sides one outdoor adventure at a time. Some legends say that Hawai’i’s frequent rainbows represent the ancient gods above watching their islands below. After the island of Kaua’i’s rain showers, rainbows spring from cloud-wrapped mountains, arch over taro fields, span green valleys, stretch across beaches and disappear in the vast Pacific Ocean. With so much beauty to behold, it’s just natural that the gods are always eyeing Kaua’i. My husband Bob, 12-year old son Will and I saw rainbows daily as we explored Kaua’i during a week in August. Measuring roughly 552 square-miles, the circular island is the oldest and northernmost populated Hawaiian island with 63,000 residents living mostly on the coasts. Kaua’i’s wild, mountainous interior has been virtually untouched since the island’s volcanic birth around six million years ago. Locals call their island’s coastal shores “sides,” all offering varying degrees of outdoor adventure including kayaking, horseback riding, zip-lining, surfing, fishing, snorkeling and hiking. Just as diverse, Kaua’i’s lodging options range from big brand hotel resorts, smaller privately-owned hotels and rental condominiums to cozy cottages, bed and breakfasts and permit camp grounds. Kaua’i’s L?hu’e Airport between the South Side and East Side is the island’s county seat and air-cruise transportation center with museums, golf clubs and shopping centers. The South Side offers family-friendly, big resorts, golf courses, botanic gardens and sunny Po’ip? Beach (a favorite family snorkeling beach sometimes visited by Hawai’i’s endangered monk seals). The East Side— also called the Royal Coconut Coast named after 10 miles of sprawling, coconut palm tree-fringed beaches where Hawai’i’s royalty resided — is blessed with a calm beauty, cascading waterfalls, the Fern Grotto, verdant Wailua River State Park and ancient shrines honoring great Hawaiian chiefs. 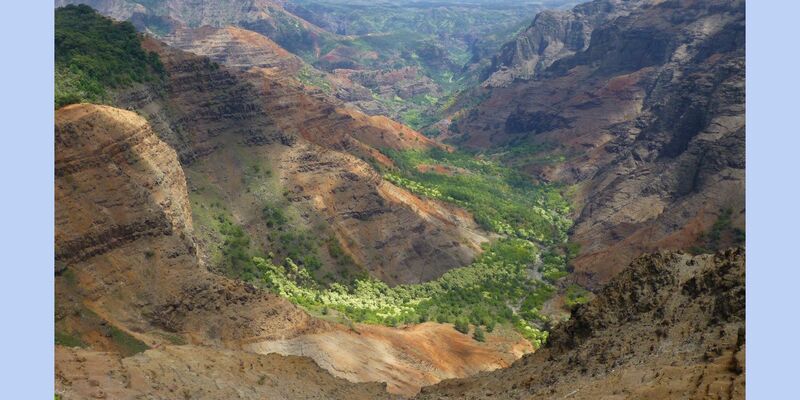 The West Side boasts of dramatic Waimea Canyon encompassing two state parks. Most catamaran sailing trips depart from the West Side to sail around the N? Pali Coast’s cliffs shooting straight up from the ocean’s floor. The rugged North Side’s N? Pali Coast State Park draws hikers while mountain-cradled beaches, lush river valleys and Hanalei Bay attracts surfers, kayakers and paddle boarders. I launched myself from the rocky outcropping, swinging on a rope over the clear waters, and let go splashing into the mythic Fountain of Youth. I wish. This tropical pond played the eternal age-stopping waters in the movie Pirates of the Caribbean On Stanger Tides. While my plunge didn’t erase any laugh lines, it sure made me feel like a carefree kid again. This was just one Hollywood filming location and historic site on Kaua’i’s South Side starring in on our Hule’ia River kayaking-hiking, half day trip with Outfitters Kaua’i (808/742-9667). Traveling to and from the kayak put-in docks there’s the Kipu Ranch’s lush mountain meadow where Brachiosaurus grazed in Jurassic Park. Families with kids of all ages and athletic abilities paddle through Hule’ia National Wildlife Refuge and the State of Hawaii Conservation District past the film site where Harrison Ford vine-swung from shore and swam to a seaplane amid a cloud of arrows in Indiana Jones Raiders of Lost Ark. The 2-mile, downstream paddle (and motorized boat ride back) weaves through the forested river valley passing the 500-year old ‘Alekoko Fish Pond, a testament to the ancient Hawaiians’ sophisticated aquaculture, listed on the National Register of Historic Places. Legend claims mischievous, magical Menehune built overnight the enclosure of piled rocks at the mouth of the Hul?’ia River. On the relaxed jungle nature walk along a mostly flat, trodden trail, we didn’t see any wild boar that reportedly outnumber Kaua’i residents four to one. But our guide told us about local boar hunting technique, shared forest lore and pointed out native plants. The kukui nuts were used by ancient natives to light tiki torches and make tattoo ink. The noni leaves served medicinal purposes; awapuhi ginger is good hair conditioner; and the wild strawberries make good snacking. Little kids love how “shy grass” (the mimosa pudica plant) rolls up its leaves tight when touched. 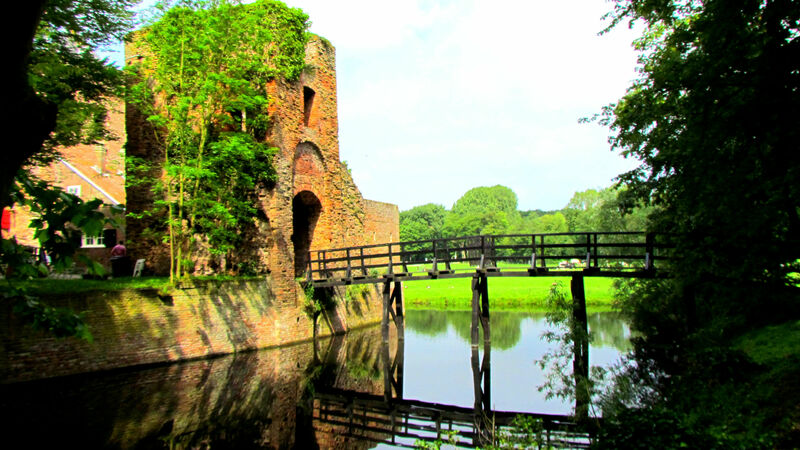 Round out the South Side’s river trip with local culture in tiny Old K?loa Town, a preserved, late 1800s village packed with island sugar plantation history. K?loa History Center traces the establishment of Hawai’i’s first sugar mill here. Family-owned shops and art galleries fill the pastel-colored wooden, corrugated metal roofed buildings shaded by monkey pod trees. To the west, cliffside views of the rugged N? 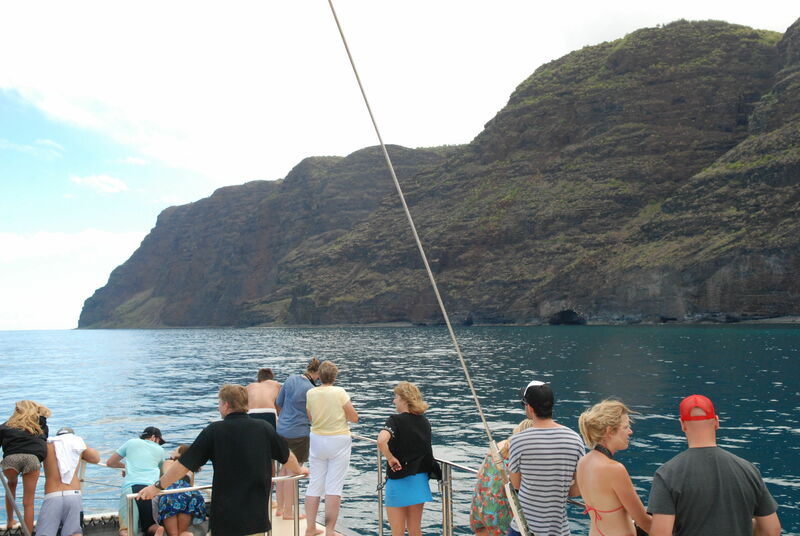 Pali Coast are best seen on catamaran cruises like the sailing-snorkeling trip we took with Captain Andy’s Sailing Adventures & Raft Expeditions (808/335-6833). While eating a delicious burger lunch we marveled at the jagged coastline. The N? Pali Coast mountains’ razor-sharp peaks fold upon themselves like a giant green fan gripped by the writhing waves. The point where the fluted cliffs’ green vegetation stops and the ravaged black lava rock starts marks the amazing heights reached by the relentless, pounding Pacific. All three of us laid belly flat on the taut canvas trapeze stretched between the sleek Southern Star catamaran’s hulls. Big swells flung our legs airborne behind us and spewed salty froth in our faces. With our arms outstretched like wings, we flew low and fast like sea birds over the rolling blue. But surprisingly, calm water tucks into the sheer cliffs (pali) sheltering coral reefs, and here, crew members joined us and instructed Will on his first ocean snorkel. He was as much at home in the sea as the flitting tropical fish. More Kaua’i wildlife greeted us when we docked at Port Allen on the West Side. Robust, russet feather breasted chickens unabashedly rule the island. Will called the noisy birds “Jurassic Roosters.” Locals lovingly refer to them as the island’s state bird, although that official title belongs to the endangered, wilderness-residing N?n? Goose we hoped to glimpse in Waimea Canyon. The West Side’s biggest attraction is Waimea Canyon, (808/587-0300) a 14-mile long, 3,567 foot deep gash through Kaua’i’s center exposing the island’s core of layered, multi-colored rock. Waimea means “fresh, red water” referring to the color of water flooding the canyon after frequent heavy rains. Entrance to the drive up the canyon is in Waimea Town, a designated National Trust Preservation Site and where explorer Captain Cook first landed on Kaua’i in 1778. The quiet, historic plantation town is equipped with the traveler’s essentials including a bank and a couple of food stops perfect for grabbing a picnic lunch to eat at one of the many canyon scenic spots. Da Booze Shop BBQ & Grill (808/383-9953) makes tasty pork sandwiches. Ishihara Market (808/338-1751) prepares traditional Hawaiian plate lunches and good, Japanese-style bento box meals. Leading up from town, Highway 550 clings to the edges of Waimea Canyon climbing through scrub-brush studded, sun-baked rock and emerging in the cool, green forests of K?ke’e State Park (808/335-9975). In lush, mountaintop Kanaloahuluhulu Meadow there’s a lodge, restaurant and log cabin visitors’ center housing a small, yet comprehensive museum. Exhibits showcase the island’s wildlife, plants, varied ecosystems and geographical history of how violent ocean volcanoes birthed Kaua’i. Throughout the park, landscapes laced with 40 miles of hiking trails range from arid, volcanic rock ridges and dry koa forests to ‘ohi’a rainforest and swamp. 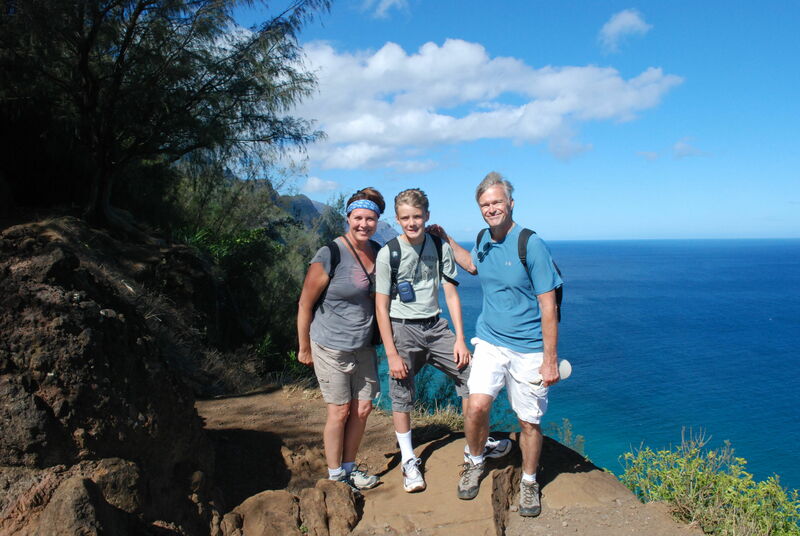 Helpful park staff recommends the most family-friendly treks. Plan on half a day knowing that a morning visit is best because in the afternoon, drizzling fog rolls in enveloping Kawaikini’s summit and the 5,140 foot, inactive volcano Mount Wai’ale’ale (one of the wettest spots on earth receiving over 400 inches of rainfall a year). The most dramatic park overlook is Kalalau Valley with panoramic views of the distant, white-capped sea and surrounding, 4000-foot mist-fingered mountains. We overnighted at the Aston Waimea Plantation Cottages (808/338-1625), a laid-back Kaua’i resort on 27-acres of the former 200-acre Waimea Sugar Cane Plantation established in the 1800s and owned by the Faye family. Fragrant flower gardens encircle the Faye’s house that today doubles as the resort check-in, dining and socializing center (it also starred as the Australian sheep ranch house in the movie The Thorn Birds). White rocking chairs line the long veranda overlooking a stately grove of towering coconut palm trees swaying in gentle trade winds. A small museum documents Faye family events and their influence on Hawai’i’s sugar cane history, evidenced by the crumbling sugar cane mill’s ruins and a tiny plantation workers’ cemetery. Guests stay in 57 comfortable, modest cottages salvaged from shuttered plantations around the island, all restored to period and outfitted with modern conveniences. Giant banyan trees shaded our 1930s-era, mint green cottage decorated with vintage rattan and mahogany furniture. An empty hammock suspended between beachfront pine trees tempted a snooze after swimming in the backyard-like pool. Because the resort flanks the Waimea River that flows into the ocean, powerful currents make the stunning black sand beach treacherous. So guests head to Salt Pond Beach Park named after the nearby sea salt ponds where only designated Hawaiian families have harvested sea salt for generations. We joined sun-soaked beach-goers on a trodden path to roadside Jo Jo’s Shave Ice Shake, a sticky-floored shanty scooping Hawai’i’s signature sweet treat. A relaxed dude shoveled finely shaven ice chips into inverted giant birthday hat-shaped cones. He scribbled a Kaua’i rainbow of colored flavor syrup stripes across the ice mounds and drizzled a cloud of condensed milk on top. Will loved the tropical rainbow-flavored shave ice with macadamia nut ice cream. Lead guitarist Gabby Manintin sung lyrics of love, life and legend in a high falsetto voice signature of old Hawaiian songs. Born on Molika’i and raised with the “old music,” Gabby explained that many, many years ago women did not dance and sing, so the men imitated them. Posing for pictures with us, Gabby made the shaka “hang loose” hand sign extending his forefinger and thumb showing off his long, pointy finger nails shaped like guitar picks. He flashed a coconut white, toothy smile and says “Shaka-rific” to encourage grins all around. It not only worked like Menehune magic, but perfectly described our stay on Kaua’i’s West Shore. Along the Kalalau Trail in the N? Pali Coast State Wilderness Park there’s an awesome view at every turn. Rocky outcroppings jut free from the dense forest to perch hikers above rolling, endless ocean. Bob, Will and our spry guide Micco Godinez dashed up the narrow and twisted root-strewn trail leaving me behind in the tropical tree canopy. That’s OK because my slower pace along the clinging coastal path freed me to frame photos of wave-crashed cliffs and windswept palm tree beaches. Eventually I caught up with the guys at these spots because the views stopped them in their tracks. The first two miles of the 11-mile trail in the Kalalau Valley are doable in a day or less by novice, but vigilant hikers. Only very experienced hikers trek beyond Hanak?p?’ai Beach. 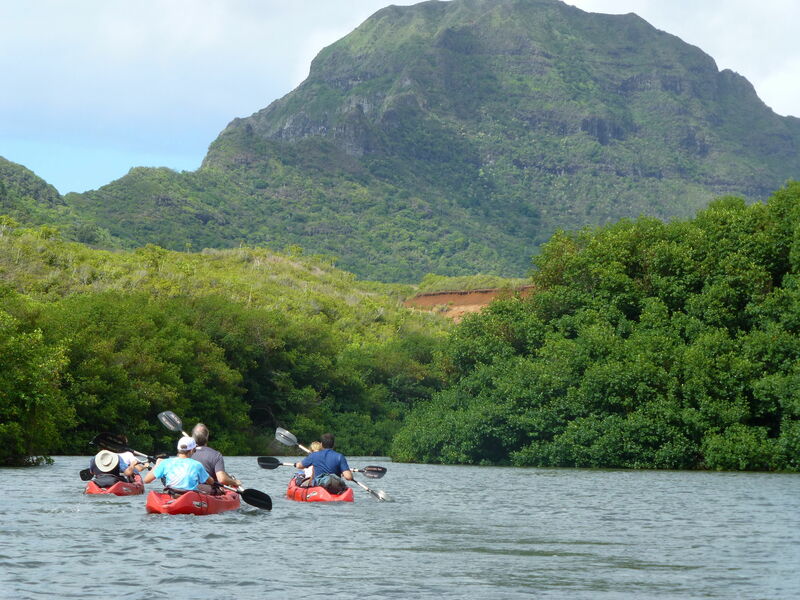 For our trek, we joined Micco and his family’s company Kayak Kaua’i that’s been leading hikes and kayak expeditions around the N? 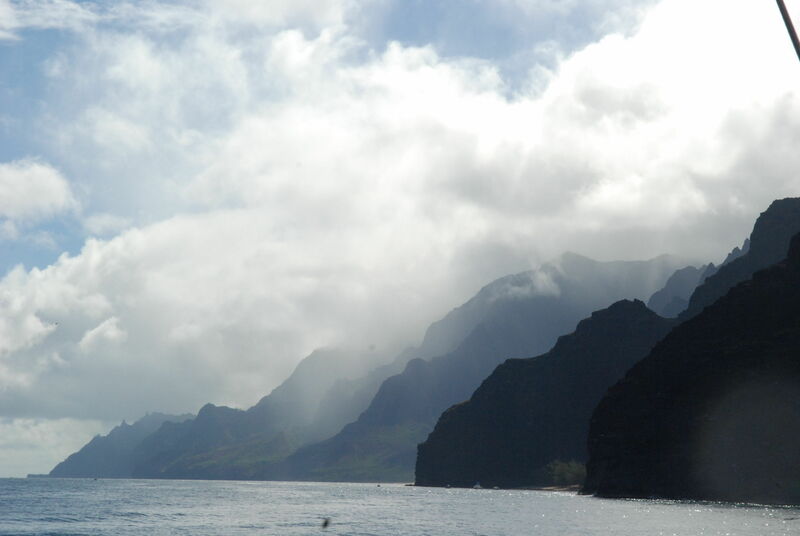 Pali Coast and Hanalei’s valleys for almost 30 years. Micco knows the trails well, pointing out native plants and wildlife and sharing local lore inspired by the Edenesque-surroundings. But beauty has its dangers, and Micco prepared us for them – slippery rocks, sticky slick mud (we witnessed an unfortunate hiker’s helicopter evacuation), and windy, narrow cliff trail sections (no guard rails). Our destination and turn around point was Hanak?p?’ai Beach, an idyllic picnic spot, but not for swimming any time of year. Signs posted along the trail tally the number of people who‘ve drowned at this pretty pocket beach. We pretended we were pirates hunting for treasure in dry caves gnawed out of the cliffs’ bases by raging winter waves. Atop smooth boulders shaded by coconut palms, we ate our sandwich sack lunches and soaked in a cool mountain-river stream before retracing our steps back to the trailhead. After our hike, we sacked out on Hanalei Pavilion Beach Park’s cinnamon sugar sand between a giant dragon and fantastical castle sculpted a few days earlier during Hanalei’s annual Sandcastle Contest-Festival held in August. Stand up paddle boarders glided around the bay and families played in the gurgling waves gently stroking the horseshoe beach. Celebrities cocoon in private, waterfront estates and at the exclusive St. Regis Princeville Resort up the coast. Come winter, world champion surfers ride thundering, 30-foot waves into the bay. But that’s hard to imagine on this tranquil summer day. Tiny, mostly residential Hanalei cradled by mountains turns touristy in summer. A constant stream of flip-flop wearing customers feeds through the few streets and past the 1837 restored mission church on their way to the beach, shops, art galleries, restaurants and bars (Tiki Nui bar is a movie scene in The Descendants). Always crowded, but worth the wait, seaside Hanalei Dolphin Restaurant (808/826-6113) serves charbroiled fresh fish and rainbow poke, a colorful mix of fresh, diced tuna, salmon, white fish and avocado tossed in “broke da mouth” spicy sauce. We also shopped Hanalei’s busy grocery store to stock our condominium rental unit’s kitchen at beachfront Hanalei Colony Resort (808/826-6235). The very private condo complex outside town close to N? Pali Coast State Wilderness Park has a swimming pool, upscale Mediterranean restaurant, day spa, recreation room and coffee shop. The resort is close to Limahuli Botanic Preserve and Tunnels Beach, one of the North Side’s best family beaches. In the distance, pyramid-shaped Mount Makana represented the exotic island called Bali Ha’i in the movie-musical South Pacific. Lifeguards patrol the sweeping Tunnels Beach and its protected coral reef waters where we snorkeled with a sea turtle. Our last night on the island, we dined on our condominium’s balcony and said goodbye to Kaua’i at the beach. We settled on a bleached white tree branch and watched receding surf write, erase and re-write chalk white, curvy bubble lines on the glistening sand. Clouds unfurled revealing the freshly drenched, green mountain tops. Behold! A shimmering rainbow of pink, orange, yellow and blue burst forth. It arched overhead and dissolved in the ocean. Ah, the ancient Hawaiian gods couldn’t resist peeking again at their paradise below. And just like them, we’ll never get enough of Kaua’i’s beauty. Driving: Pack patience when driving around Kaua’i. Only three of Kaua’i’s coasts are truly accessible via a twisting, perimeter island road network connecting them (Highways 50, 56 and 560). During high season summer months, roads with single lane bridges can slow to a standstill. Taro farm trucks, tour busses and cars must downshift to Kaua’i’s slower pace that’s required to traverse single-lane bridges. Swimming: While Kaua’i is a year-round destination, water conditions vary by season. No matter when you visit, we recommend swimming at lifeguard-surveyed beaches only. Kaua’i’s 45 beaches each have their own beauty and dangers ranging from strong currents and rough surf to sudden drop offs and sharp coral. Check out the Kauai Explorer for daily beach, surf and ocean safety conditions. The Kaua’i Ocean Rescue Council, a non-profit organization supporting the island’s fire departments and lifeguard agencies, produces a good brochure called Kauai Beach Safety Guide listing by island side all the beaches, their specific hazards and those with lifeguards (pick one up at the airport and island tourist information kiosks). 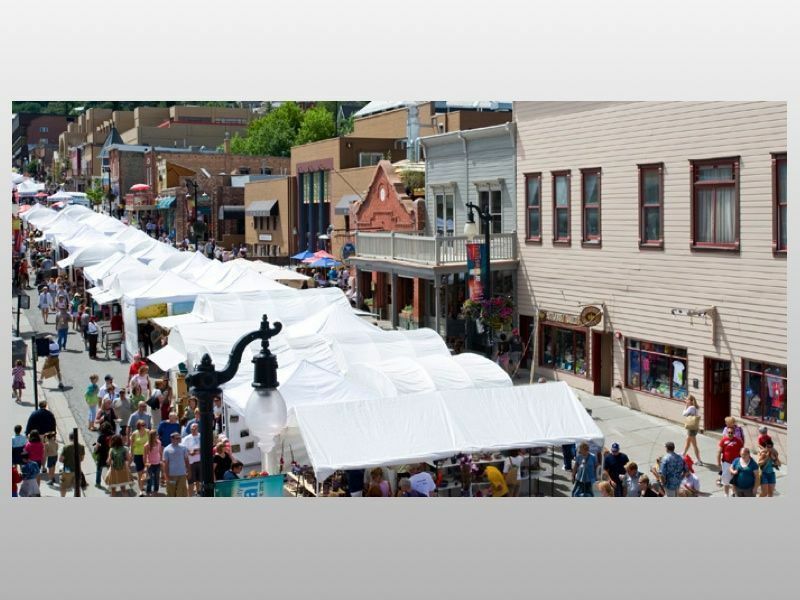 Sharing: Talk with locals and other vacationing families you encounter along the way. You not only may make new friends and learn about good restaurants, but maybe even score great beach gear. A family we met at a L?hu’e Airport sold us their gently used, week-old boogie boards and three sets of snorkeling gear for $40 cash. Their best beach advice and equipment saved us time and money. Staying Safe: Whether hiking a wide, flat path or twisting, cliff hugging trail, wear close-toed, tread-soled shoes. Slather on sun-screen, bring insect repellant and drink lots of water. 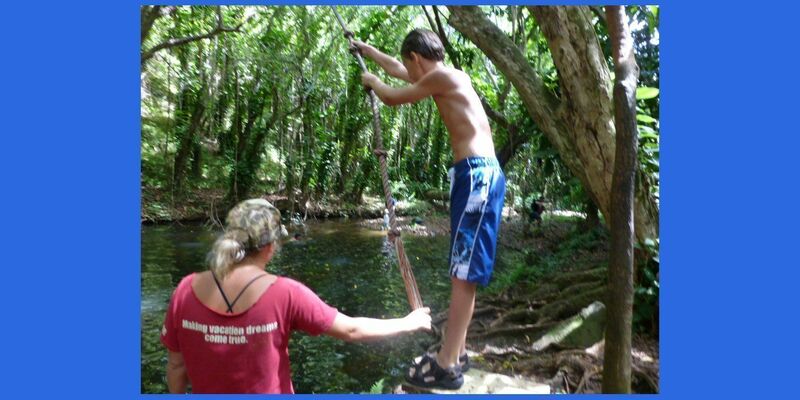 Kaua’i’s ecosystems and wildlife make it magical for families. Always pack out your garbage, stay on the trails and don’t pick plants. Endangered monk seals and sea turtles swim around beaches’ shallow waters and sleep in the sand. When encountering wildlife, stay quiet and keep a safe, respectful distance. For more information and reservations, contact the Hawai’i Visitors and Convention Bureau (800/464-2924) or the Kaua’i Visitors Bureau (800/262-1400).